This picture is of the first and only King of Haiti. The enslaved Africans in Haiti, led by Toussaint l'Ouverture, Jean-Jacques Dessalines and Henry Christophe eventually won their freedom. Toussaint died in a French prison, whilst Dessalines was murdered in 1804. Christophe as commander of the army took control of the north of Haiti, while Alexander Petion, his rival, became president of a southern republic. 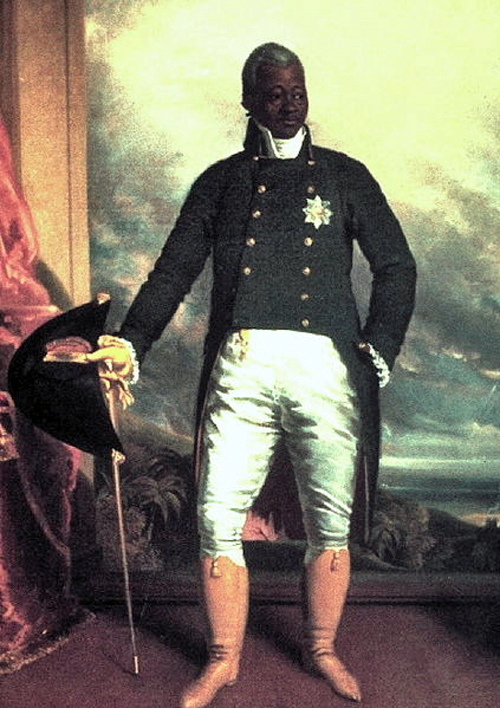 In 1811 Christophe made himself Henry I, King of Haiti. His country lived under the threat that the French would try and reclaim it. In 1815 Thomas Clarkson began correspondence with Henry Christophe. Henry hoped for trade and international recognition, which had been withheld. He turned to Wilberforce and Clarkson for support. Clarkson became Haiti's European advisor. Clarkson travelled to Paris in 1819 and 1820 to gather information for Henry. Henry shot himself after his army rebelled against him in October, 1820. His two sons were bayoneted but the Queen and her two daughters were spared. For a few months (1821-22) Madame Marie-Louise and her two daughters lived with the Clarksons at Playford Hall, near Ipswich.